Single-use plastic disposables, including plastic takeaway containers, cups, plates and bowls (usually made from expanded polystyrene or commonly known as styrofoam); plastic forks, spoons and knives; plastic straws and stirrers; plastic bags; and plastic beverage bottles, pose a serious environmental problem around the world because plastics do not break down easily in nature and could release some toxic chemicals under certain conditions. We believe that it is time for Singapore to be more serious in reducing our consumption of single-use plastic disposables. 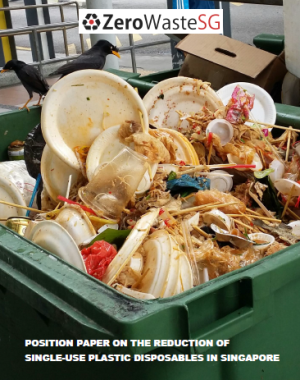 There are benefits for Singapore in reducing plastic disposables, which include: reinforcing our image as a Clean and Green city and a Zero Waste Nation; contributing to our national target of 70% recycling rate by 2030; reducing the plastic litter that goes into our waterways; and reducing our carbon emissions from the incineration of plastics. This position paper describes the current situation and problem, highlights the considerations and responses, and lists several recommendations to reduce plastic disposables. We urge the government and businesses in Singapore to consider these recommendations, and develop concrete plans and take bold actions to reduce the consumption of single-use plastic disposables. I support the Position Paper on the Reduction of Single-Use Plastic Disposables in Singapore. I call for our government and businesses to consider the recommendations in the Position Paper, and develop concrete plans and take bold actions to reduce the consumption of single-use plastic disposables in Singapore.